Day 1b of the inaugural PokerStars.net EPT event at Tallinn's delightful Swissotel saw many players take their seats in the somewhat cozy tournament area on the sixth floor of this, the tallest building in the city. After the dust had settled from nine more levels, the chip leader of the day and overall is Perica Bukara who has 210,600 in his bag. Bukara, who just a few days ago finaled the Unibet Open in Prague, will no doubt be hoping that he'll be able to finish higher than his sixth-place there for €25,800. The Serbian finished his day in style, flopping a set with against Dmitry Bezlepkin's on a board to eliminate the Russian just before the clock was stopped for the final few hands of play. The final total of players came to 420 after 239 more runners turned up to the city that is one of Europe's newest tourist hot spots. Despite the EPT Live crew not coming to the event (meaning it won't be televised) the €400,000 first-place prize for the winner is something not to be sniffed at. This prize pool drew a good chunk of Team Pokerstars Pro as Betrand 'ElkY' Grospellier, Dario Minieri and Mattias de Meulder all came along for the ride, unfortunately for them, none were able to last through to Day 2. However Team Pro members Vadim Markushevski, Juan Manuel Pastor and Katja Thater all managed to make it through to Day 2, Thater surprisingly the only woman to make it this far. For many in the media, it was actually a bit of a treat to see one of their own playing in the tournament. Benjamin Gallen, an experienced French blogger who has covered nearly 40 EPTs played his first but was knocked out toward the end of the day by compatriot Manuel Bevand who rivered an ace with ace-king against Gallen's pocket kings to bust 'Benjo'. Gallen, however, was just one of many who busted. 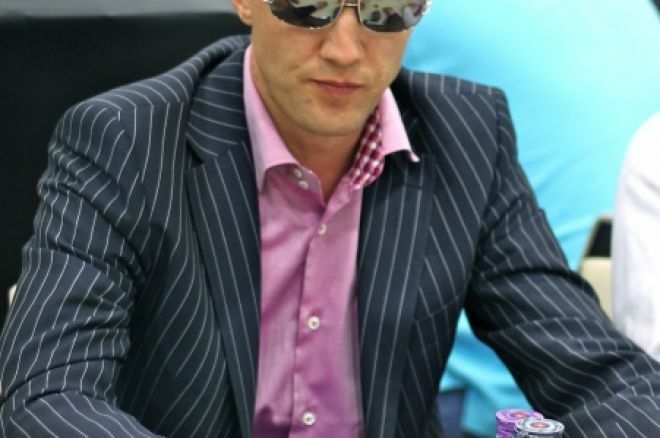 Juha Helppi, from Finland, was, in fact, the first man out of the tournament, getting his stack in on an eight-high board with kings but invariably running into aces. Other casualties included Monte Carlo High-Roller winner Tobias Renkeimeier, Sami “LarsLuzak” Kelopuro, Michael Tureniec, Shaun Deeb and EPT Berlin champion Kevin McPhee. Despite this loss of many of the big-name players expected to make it through, there are still many involved in the mix for tomorrow's action. Santiago Terrazas, who finished third at the EPT in Barcelona last year, has 176,300, and Dutch WSOP bracelet winner Marc Naalden (114,600) had a strong day during which he was always accumulating chips carefully, never seemed to lose any big pots. The excellent success of this tournament has been tempered slightly by a general lack of local Estonian players, but in Vallo Maidla (123,300) they do have someone with a strong stack and a real chance of going deep in this tournament. With 120 players having survived this day, combined with the 90 from yesterday, the 210 remaining will come back tomorrow to fight to make into the 56 paying spots and have a chance to become the first EPT Tallinn champion. The PokerNews Live Reporting Team will be bringing you full updates from Day 2 of the tournament on Friday from 12:00 p.m. (GMT+2). Join us for all the action!